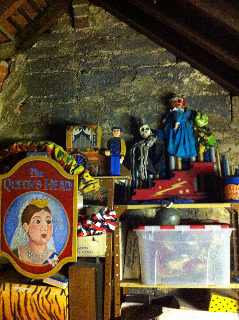 Or….Memories of Norwich Puppet Theatre. Some extraordinary things appear as if from nowhere, and then after a while they become normal, and then taken for granted, their origins ignored and unknown. Such is the case of Norwich Puppet Theatre, one of a very very few dedicated spaces in the UK, and as rare as hens’ teeth. Hand to Mouth Theatre (Martin and Su) has a long connection with the place and the people involved in it, stretching right back to its beginnings 40 years ago. Fresh out of Art College, we rented a winter let on the Norfolk Broads, with the intention of helping establish a new craft gallery. 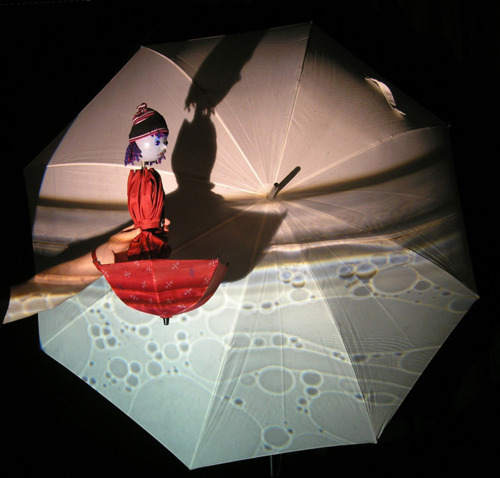 At the time we had performed a little with an experimental animated show, and also a traditional one. We felt in awe of arts professionals in general, and of Ray and Joan Da Silva in particular, as Martin had strong memories of watching their popular large scale productions as a young teenager. 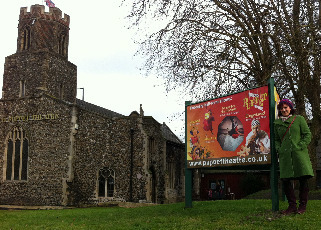 So one time when we went on our weekly bus journey into Norwich we visited the decommissioned church that was to become the puppet theatre, we felt too shy to go in amongst the building work and rubble to say “Hello.” Silly really, in retrospect. Two or three years later (1981) Martin was awarded a bursary from the Gulbenkian foundation administered by the Puppet Centre in London, and we travelled back up to go to their AGM at the newly opened theatre, and a little after that Martin joined the Da Silvas for a short run of “Hansel and Gretel”, a large scale marionette show that toured northern and midlands theatres, including the Sunderland Empire. A few years later (1990), having established his own touring company, Martin was amazed and delighted to be booked at the theatre for his solo “Big Top and Small Tales” show. Hand to Mouth have performed almost every year since , sometimes as solo performers, and sometimes together, and sometimes visiting more than once a year. 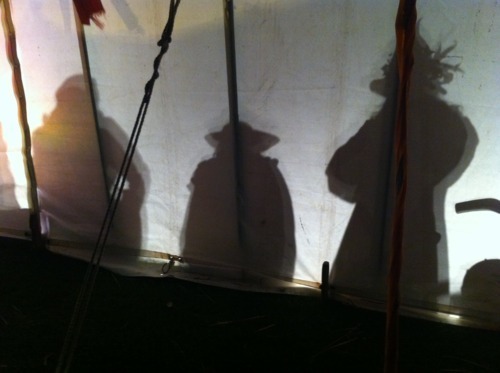 We performed at the 25th anniversary celebrations, and our abiding memory was standing backstage holding our portable stage on a rucksack arrangement for what seemed like half an hour while the previous act waited for kettles of water to be supplied for their water puppet spoof, as the theatre’s boiler had broken. We’ve been aware of the roller coaster of difficulties of keeping the NPT alive, have watched artistic directors come and go, and have been full of admiration for the tenacity of Ian Woods in particular. Special mention should also go to all the behind the scenes people, the volunteers, and to the extraordinary dedication of Darren who puts in endless hours covering a host of duties. Live and interactive theatre is needed now more than ever, as a counter-balance to excessive screentime, and Norwich Puppet Theatre surely deserves greater appreciation and be more highly valued. Funny business, this funny business! The question of bums on seats, artistic integrity, and nostalgia are all mixed up for us at the moment! Just recently we performed our “Goldilocks” show to full houses at the Nuffield Theatre, Southampton, and at Watermans in South London on consecutive days, and as far as we could tell, everyone left feeling happy, having had an uplifting experience. We also left the theatres feeling happy and uplifted, though for the additional reasons that this show was more or less the same one we devised in 1983, being our first attempt at a non-Punch and Judy piece for children. That’s right… the show is 34 years old, and the first one we thought of! We continue to perform it from time to time because the title draws people in, and the show itself still works its magic. Naturally we’ve devised and performed lots of different shows since then, and in a variety of styles, often stretching ourselves artistically, and pushing the artform a bit as we have done so. We’ve included table-top puppets with the operators visible, we’ve become characters ourselves acting with puppets, and we’ve used state of the art technology with sound, lights, and projections. Our background is in fine art and performance art as well as being interested in folk and popular forms of expression. 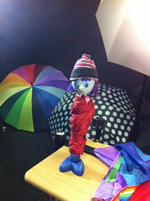 So why is it that a simple glove puppet show with live music has such a strong and satisfying effect on the audiences? Despite all the advances in childrens’ theatre and puppet theatre in particular, there remains a truism that “what’s old becomes new” to a new generation. Being brought up with screens, and being over-familiar with the apparently interactive media, glove puppets with the puppeteer hidden appear to children to be more magical and direct than ever. Obviously we think that the way we do it is key to the show’s success, but that’s not for us to judge. It’s quite amusing to think of the billions being spent on developing 3D interactive immersive experiences when as far as our audiences are concerned, they experience exactly that with a few cloth characters and a hurdy-gurdy. The story is a good one too, as all the children know it, and feel safe with the knowledge. Maybe it helps that the main character is a feisty female, and a naughty one too. We play it for laughs to an extent, but also concentrate on the drama, so that all the characters are believable. There is repetition, and familiarity, but we also add a humorous villain who gets his comeuppance with the collusion of Goldilocks, the bears and the audience. The story is innocent and the form of the glove puppets is naive, which is on the right wavelength for any child who chooses to come to a show with the title “Goldilocks”. There is eye-contact from Su who acts as the narrator and musician, and this format of interpreter for the puppets is a traditional one. Because we were coming at this from having mad our living busking with puppets, there are plenty of bits of tried and tested visual gags which we would think twice about putting in new shows these days. But they work, and provide belly-laughs for children. And that sound of laughter, coupled with the sound of pin-drop silence as they watch the other sequences with baited breath, is the best sound in the world. Successful as it is, we may very likely drop this show from the repertoire at the end of the year, so I was going to say that the last chance to see it will be at the Lyric Hammersmith on Saturday 25th March but we’ve just heard that those shows are sold out too! So the last chance may well be at Polka Theatre, Wimbledon where we will be performing 6 shows on June 2nd, 3rd and 4th although the Adventure Room there is very small so these are also likely to be full. What a funny business! Maybe the show is not too old fashioned, not too challenging, but just right!!?? Darwin and the Origin of the Species of Puppets. Darwin waiting for puppets to evolve into something less frivolous. Life is movement, and movement is life as far as the subconscious is concerned. Evolutionary psychology has a plausible theory that when we were evolving, it was in our interests of survival to treat any unknown movement in the landscape or in the nearby bushes as either being caused by a living creature or being itself a living creature. Then it’s fight or flight until we can work out if it was just the wind which caused the movement. If that’s true, then that would put our suspension of disbelief in puppet theatre at a very primeval level. It explains why really bad puppetry can still have some success with an audience, at least until their intellect kicks in. With a supposedly more sophisticated audience, we can expose the technique, showing the operators/puppeteers in full view. In modern cabaret, Nina Conti skilfully plays over and over with the alive or not-alive conundrum, along with the performer/puppet relationship. Nina Conti waiting for Monkey to evolve into something less articulate! If the focus is on the object/puppet, moved with the illusion of inner life, then the effect is very powerful, tricking the intellect and satisfying the limbic. A popular example of this are the horses in ‘War Horse”, although here an added layer is given, where there is a confusion of using abstracted sculptural shapes combined with very naturalistic movement. 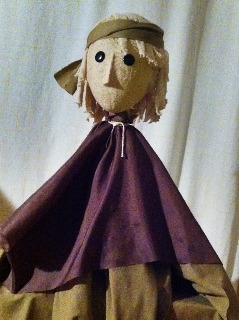 The puppet has adapted to it’s environment amongst humans telling a serious historical story. Horses for courses. Without the abstraction the horse would incline towards pantomime comedy no matter how hard the puppeteers try. Puppeteers finally being taken seriously. Next job-Daisy the Cow in Panto! Puppets in general do incline towards comedy, intentional and unintentional. Any ‘serious’ subject matter risks the whole edifice collapsing if the movement of the puppets strays even momentarily over the line . Its a tightrope, and below are the clowns waiting to take over until the daredevil its back on the wire. Within its historical environment-the bespoke puppet theatre-puppets are capable of, and indeed exploit, non-naturalistic movement. Since the revival of puppet theatre which began at the start of the 20th century, we’ve been able to see different types of puppet adapt to their most comfortable environments. Glove puppets are possibly one of the hardest forms to use for serious content,and as such have tended to find their niche among young audiences, utilising their bright-eyed belief and unselfconscious inclination to laughter. Rod puppets, stately and imposing, tell the tales of goddesses and kings with ease, but then have had their ages old technique combined with mouth puppets to create the Muppet style which are brilliantly and completely at home within the proscenium of the television screen. A hybrid for a new medium. Marionettes, which somewhat annoyingly remain in the popular imagination as intrinsically proper or sophisticated, are perhaps the only ones which have failed by and large to adapt to modern tastes and changing theatrical environments. An evolutionary cul-de-sac maybe? 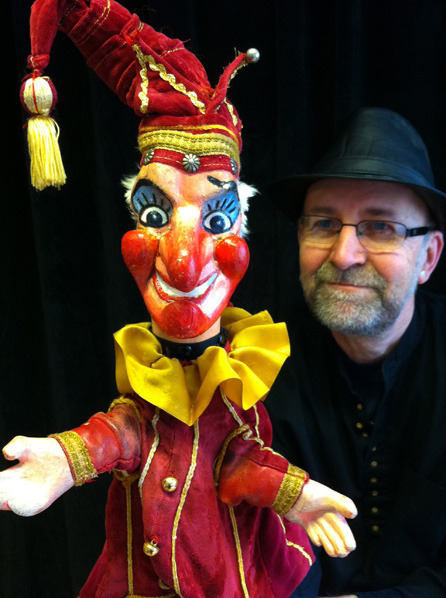 Though the puppet artist Stephen Mottram may be the exception who disproves the rule. Stephen Mottram. 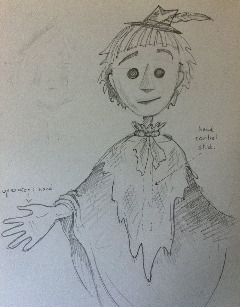 Re-imaginer of the potential of marionettes. Further theatrical engineering brought animatronic puppets to the big screen, now more or less supplanted by CGI. Computerisation has spawned another variation with the creation of the realtime operated CGI character. Puppetry once again, though it probably dare not speak its name in that rarified context. But the problems and complexities of the “P” word might be the subject of another blog! Performances abroad are the cherry on our theatre cake. We never plan where to go – the invitations come randomly and unexpectedly. For our Romanian adventure in October, our third foreign festival this year, we were recommended to the organiser by Nik and Sarah from Noisy Oyster who had performed there last year. Based in the northern city of Iasi (pronounced Yash) towards the Ukraine border, it was a visual/physical theatre festival and a fairly prestigious one too – companies from 15 countries were performing. We were only able to see three of these due to scheduling, but as always these opportunities provide us with inspiration which is sometimes lacking in homegrown shows. Of particular note was a Czech presentation entitled “Putin goes Skiing” which used a minimal set to create imaginative and sometimes absurdist scenarios for the harrowing machinations of Putin, based on the book “A Russian Diary” by journalist Anna Politkovska, who was murdered in 2006. Image from “Putin goes skiing”. Following us on the small stage in the Iasi theatre was the Philippe Genty company performing “Odyssey”. We had seen an English language of this before in London but this time performed in French, the performers were more relaxed and able to enjoy the free flow of the comedy between themselves, and I understood far more what they were aiming at. It had many moments of satisfying invention, but the self-referencial conceit is not, in my opinion, enough to justify the length of the show. A great performance nonetheless, and deserving of the thunderous reception. The third show we saw was a site-specific piece which was commissioned for an underground lake in a salt mine, and was partially re-created for the festival by staging it on a nearby stretch of water. A lone actor on a raft searches for an exit, and muses on …..well we couldn’t be sure as we didn’t understand the language but no doubt he’s musing on the meaning of it all! A fantastic performance from Florin Vidamski and an unforgettable experience. Our Piggies did us proud, as the packed audiences of children and adults responded in a way that was quite wonderful…delighted by the comedy and silent and rapt for the more poetic sections.We were overwhelmed at the end of each of our two shows, especially with the gifts of flowers from the children. Thanks to Oltita Cintec ( the artistic director) for the invitation. Thanks also to the very attentive and helpful technicians in the theatre and also to the lady who swept the floor after we’d left it littered with paper snow! Pigs continue to fly! A festival director from Austria was in the audience for our first show, and was so enamoured by the piggies that she’s invited them (and us!) to perform in 2015. Thank you Piggy-Wiggy! The Hatching of the Egg. In response to the often asked question “How do you put a show together?”, here’s a breakdown of “Flights of Fancy” which is currently touring festivals this summer. We’re fairly practical in our approach-we make a checklist of the artistic elements we’d like to include, along with a checklist of the practical considerations of how to actually do it. It’s a question of balancing daydreamy ideas against the nuts and bolts. Fear of failure is a constant factor which we try to hold at bay by reassuring ourselves that we’ve done it before so we can therefore do it again. But within that thought lies the fear that we are simply re-hashing old ideas and staying within our comfort zone. so we try to make sure there is at least some element of risk in a new technique or approach. We need to believe that pigs can fly. Travelling to and from gigs in the past couple of years has provided time to brainstorm possible directions for our festival performances. Our nominal starting point for the new project was to use Commedia stock characters with a ritualistic feel, live music, and a practical performing set-up. We would also need to be able to hold and satisfy completely adult audience, as well as a family audience. No pressure then! We liked the idea of using a nonsense language and somehow incorporating a love story and a bird motif. The bird idea suggested a cage as the basis of the set, and maybe Su and me as birdlike characters. I was keen to abandon the restriction of the “Piggery Jokery” format of an enclosed walkabout theatre, and this suggested that the puppeteer being released from anonymity and the confines of his theatre would parallel the flight of the bird. We rarely worry that someone somewhere has probably done all this before. We are all fishing from the same pool, and the point is that we haven’t done these ideas, and our audience almost certainly hasn’t seen them before. We already had the technique for flying a bird into the audience (used successfully in our “Mad Hats” show) so we felt we had the underlying basis for a show. Working backwards, we now needed a simple story which ended with the release of the puppeteer, and the flight of a bird. Along the way we needed to integrate Su’s musical accompaniment, and to work out the relationship between our characters. We also discussed using trick puppets or variety turns, and we decided on a “Menagerie of the Imagination” being a sequence within the story. Ideas that were discussed and eliminated included skeleton birds,harpies, angels, devils, flying fish, bats,humming birds, a formation team of Red Sparrows (still a nice idea…might include that one at some point?!) a flea circus, and a human cannonball. The phrase “Flights of Fancy” was written down. While we were talking about all this, I was busy performing our schools show “Town Mouse and Country Mouse” which uses interchangeable heads on white-gloved hands, and also a sequence involving chickens made from gloves. Why not use the same technique for the new show? So now gloves became a motif which we felt we needed to justify. Why would glove enter this story of confinement and release? Maybe the gloves themselves could be released from the earth-bound hands to fly? Su drew male and female bird heads so that we could at least play with something tangible. Then we visited the Raptor Centre near Ringwood, and came away in awe at the beautiful owls and hawks. And it turned out pretty much as she imagined. 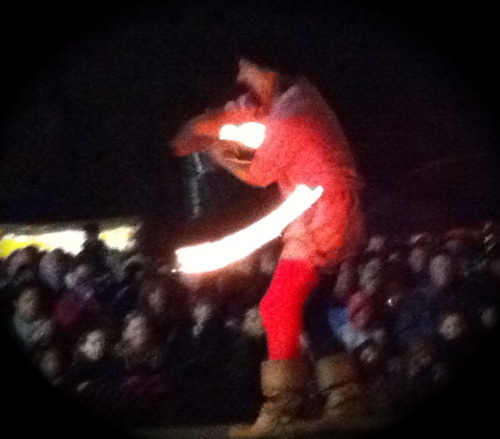 Performed within a large rope circle, the audience can choose how to view the action…the illusion from the front or the mechanics of backstage……. postmodernism and all that. After trying all different kinds of gloves for the birds, we played around with some cheap cotton ones (5 pairs for 99p!). Su said “They’re Glovebirds!” and the show moved into a higher gear. Now all the birds would be glovebirds, and the compere would have the job of educating the audience about the variations within the species, in a kind of nature mockumentuary. Mixed in with this would be the idea of an airline steward or stewardess giving spoof health and safety instructions, to enable the audience to be taken on a flight of fancy. So now we have a physical structure-a quick assembly puppet theatre-and a dramatic structure. the two birds build a nest, lay an egg, the baby bird hatches and eventually learns to fly, after a series of novelty routines. 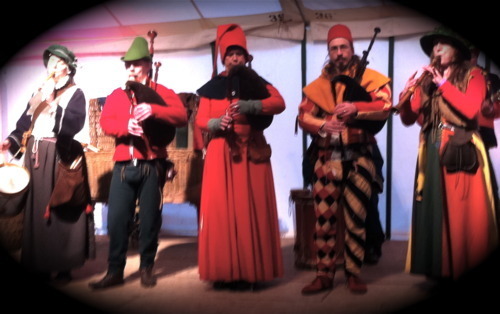 Now Su could think a bit more about the music…we’d agreed the Hurdy-gurdy should feature, it being possibly the perfect small-scale show accompaniment…..but we weren’t sure about appropriate bird sounds. We tried all kinds of whistles and noisemakers, and settled on a double whistle I’d brought back from Budapest years ago. Su came up with some great original tunes fairly quickly, based on the requirements for the characters and action. She is able to visualise completed designs and tunes, whereas I have to go through a longer process of dreamy cul-de-sacs before solutions come to me! But what about the script? That’s one of the last things to do when putting a visual-based show together. We had given ourselves the restriction of not talking as human characters. So that leaves just the puppets. Puppets talking is deathly theatre when there is no action. The script serves the action and needs to be cut to the bone. We were approaching the deadline of our first performance (Beggars Fair in Romsey) and were struggling to get a cohesive show out of our bits and pieces. We called on our good friend Clive Chandler and he gave generously of his time and expertise for a couple of days., helping us through rehearsals in our local village hall. He really pulled it together with his patience, perception and practicality. Thanks Clive! He identified the dramatic aspects of the piece, and sure enough he was proved right in the debut show. At the time of writing we have also performed “Flights of Fancy” at the Warwick Folk Festival, and it’s certainly proving popular. It has its own distinct flavour which marks it out from previous shows, and with repeated performances it will no doubt tighten up a bit, and we will hopefully discover all kinds of delicious moments which are hidden from us right now. Thanks also to my brother Don for the photos of our first performance. It’s 24 years since Jim Henson died at the early age of 53, and I’ve just been reading his biography by Brian Jay Jones. There is much to enjoy and wonder at in this book, but I guess the principle elements that stand out for me are his extraordinary drive and sense of purpose, coupled with optimism about himself and his work. Apart from the staggering amount of work he did, it was the quality of the work which was always the key factor. Coming from an American culture it’s no surprise that in order to achieve his personal vision and mode of self-expression he needed to finance those dreams with hard-nosed business decisions relating to commercial work, always treading a fine line between the two. The purpose of the money was to finance better work. Also key to his attitude was that puppets were a means to an end i.e. to be involved in TV and film, and his invention of a new form of puppetry was subservient to this goal. All the main performers were reluctant puppeteers at least at the start, despite their brilliance and commitment to the work. It was fascinating to discover that the first book he read about puppets was Obratsov’s “My Profession” which remains one of the few books giving insights into the deeper motivations behind puppet theatre creation. Obratsov was quite revolutionary in presenting cabaret numbers which used a moving mouth operated by a concealed hand (The drunkard) and also a puppet which used human hands as its own (Ritardando). He was also using the kinds of raised staging which Henson would later adopt. In France Phillipe Genty was presenting the kind of variety show parodies using bright, feathery,and goggle-eyed creatures which paralleled the early Muppets. In recognition of these and other innovators, and maybe as a nod towards their influence, Henson put together “Jim Henson presents the World of Puppets”in 1985. One of those performers was Bruce Schwartz, whose mastery of both a rustic style of glove puppetry and a highly refined table-top style resonates still with me, and also I’m sure with a lot of other performers of my generation. Jim himself was keen to encourage new performers to investigate new means of expression, and not just follow the form that he had made successful. He surely must have found it strange to have spawned an entire generation of American puppeteers, amateur and professional who have adopted the Muppet-style of operation. My contact with him and his work was minuscule, but nevertheless profound. I’m proud to have made Jim laugh with my audition piece for “Labyrinth”and apart from several weeks operating background goblins and Sir Didymus’ ear (!) in that film I later spent a couple of days being Rowlf’s right hand, and Kermit’s legs whilst filming inserts for one of the “Best of Muppets” video tapes. It was those couple of days in particular which introduced me to Henson’s extraordinary stamina, focus and quiet command. I quickly realised I was way out of my league technically, though I think I just about got away with it! I also realised the way that the Muppets had taken the art several planes away from anything I’d experienced before or since. I also witnessed Frank Oz take a minor character and use it to give a riveting performance. I was in the room with the world’s greatest puppeteers. I was both humbled and inspired. 10 years later at the “Festival of the Millennium”in Seattle, Jane Henson saw our “Piggery Jokery” show (the format of which was inspired by Bruce Schwartz) together with our version of “Punch” and spoke to me about the possibility of bringing the shows to a small theatre in New York as part of the Jim Henson Foundation’s work. Although the possibility remained just that, it is a tantalising “What if?” and also highlights the effect of the ripples sent out by Jim’s life. So many people were affected in so many ways. I got the idea from being in the audience for “Slavka’s Snow Show” where a huge auditorium is covered in paper snow. I wondered if I could recreate this in miniature and so now at the beginning of the Winter sequence of “Piggery Jokery” snow falls, and if my aim is good, it covers Su who is playing music next to the puppet theatre. She gets laugh from a perfectly timed raised eyebrow. The effect is produced by using an aerosol can of water-based stage snow, and it melts away after a minute or two. I bought several cans of the stuff, because I keep leaving them behind all over the world. They can’t be flown, you see. I found this out after being interrogated by security in Korea, which is not an experience I’d recommend. Pressurised cans explode in de-pressurised airline holds don’t they? So what I do now is this… I send a can surface-mail three months in advance of a festival booking. Going by sea and land gets around aerosol problem. And there’s little point in getting into the hassle of posting it back to myself from a foreign post office, so I donate the can to whoever is interested enough to accept it. My generosity knows no bounds. This system has worked well for Canada, and for a festival a year and a half ago in Taipei the capital of Taiwan. We performed again in Taiwan recently, in a different city, quite unconnected with our previous visit. This booking was confirmed at the last minute so no time to send the can in advance. Winter without snow…. climate change is clearly affecting puppet theatre now. We experimented with paper confetti but it was a poor substitute. The gag isn’t essential, but it was a bit frustrating not to include it. Then I had the blindingly obvious thought that maybe I could track down the can that was already in Taiwan and use that! Oh the power of Facebook…we found the right person and did our best to explain the situation. Not very hopeful of the outcome due to translation problems. Indeed the negotiations for the festival were fraught with misunderstandings and changing criteria. We focussed on the large amount of preparation any foreign festival entails, and forgot about the snow. We arrived in Kaohsiung and went to the theatre complex where we were to perform. What a place! And what a privilege to be performing in a purpose-built museum celebrating the art of the shadow puppet. We even had the deep delight of watching a performance from the Yung Shing Le troupe who were the real deal – popular folk theatre with dynamically and sensitively operated characters with a genuine connection with their audience. https://www.facebook.com/YSLST. Just as we were getting adjusted to our new environment, and beginning to think about our own performances we were presented with a parcel containing the fabled snow! All the dots had connected, and now we felt quite confident we could present the complete picture . 200 Taiwanese say "Piggywiggy" ! Time for more cans of snow to be sent on adventures. The mystery is where will the next destination be? Was it Confucius who said “Pigs will fly, but snow will explode”? As a creator and performer of visual theatre, I realised the partial answer for me a while back. A lot of my best ideas come from day-dreaming visual aspects of concepts and allowing them to change shape and meaning, until something useable appears. And I believe the training for this lies in my favourite childhood game of Squiggles. Dad was keen on it, and I also played it often with my brothers. Here’s how it works: one person draws a non-specific squiggle and the other person finishes it by changing it into something recognisable.There were a few basic do’s and don’ts e.g. in the original squiggle no lines must cross. Certain easy solutions were banned: e.g.no mountain ranges.If it turns out a bit surreal then then a rational explanation is given e.g. “It’s a caterpillar eating a football”. I recall the co-operative nature of the game, which also helped dispel inhibition. Seeing visual potential in an apparently random group of lines or shapes is a great intro to creativity. There is also an innate human tendency to help make sense of the world which tends towards seeing known images in unknown shapes. This is known as pareidolia, and is responsible for the “face on Mars” claim, religious images on burnt toast and so on. Paul Klee said that a line is a dot that went for a walk, and that a drawing is taking a line for a walk. I read somewhere that John Lennon attributed the game of Squiggles to helping his creativity, though I’m not sure if he gave it that name. It’s been a while since I was in my workshop creating anything new. I look forward to squiggling some new ideas! An old idea but a good one. Buttermilk the Cow. “Well my name’s on the film’s credits…….they can’t take that away from me” I cry, as I’m dragged away to the Home for Confused Puppeteers. “I touched Jennifer Connelly whilst wearing rubber gloves….I did, I did!” It was in a scene where she falls, down a hole, Alice in Wonderland fashion, and is helped by 30 or 40 hands which materialise form the sides of the pit and support her. The hands convulse into various human-like faces and talk to her. Two of those hands were mine, and I still have them, attached to my arms, and they are available for hire. I worked for seven weeks on the film which was back in 1985. At that time, it was unusual to be a puppeteer in England and not be employed on the film. That’s because it needed plenty of hands free to operate the background crowd scenes of Goblins. This was the time when CGI was in it’s infancy, and special effects were mostly still animated by human effort. (that’s called puppetry !). Green screen for film was just about achievable, and the sequence with the characters called Fireys was a case in point. Cutting-edge technology in those days. I was full of admiration for the design of the characters and sets. This was done by Brian Froud, with whom I and Michael McCormick memorably shared a bottle of wine on the morning of my audition.. This happened when I went over from the audition room to the workshop ( the Creature Shop) where everything was constructed. McCormick’s work and attitude influenced me more than he knows.It was there I was introduced to a young sculptor and puppeteer from New Zealand called Ron Muick, who has gone on to become a world-renowned artist. I’m sure the beginnings of his technique of super-realistic skin texture can be traced to this time. This was a time of “what ifs”. There was possibility that Su could have been employed in the workshop while I worked on the performance side of things. There was the possibility of the short-term contracts being renewed almost indefinitely if I’d wished, and then on to other similar films. I think if we’d been living in London at the time that’s a direction we would have chosen, but it was all a bit too complicated. This was compounded by Su and me having just established a regular pitch on Broadstairs sands. Now, compared with the world of film, this might not sound like much. But we knew that the big bucks of the industry might be illusory and it was very important to us to have some control over our way of life, however small. I wasn’t particularly enamoured of the film world, at least not as a small cog in the machinery. I would need to be the director to feel satisfied, and my ambition didn’t stretch that far. The wasting of time waiting for a few minutes of action was painful, as was the waste of money in sets and puppets that ended up not being used. The pivotal moment was when I was operating the left ear of the dog knight Sir Didymus. The movement was achieved by operating a joystick, and the rotation of the stick matched that of the ear. More name-dropping now. As I was rehearsing this character with Dave Goeltz, Sergei Obratsov, the great Russian puppeteer and theatre director was being shown around the studio, and he watched a bit of our efforts. Anyhow, after a bit of filming of this character, Brian Henson offered me the chance of continuing with this role for another six weeks. I took a moment to consider, knowing that the summer season was about to begin. So- six weeks operating an ear for lots of money, or six weeks operating an entire repertory company of characters live, with laughter and feedback, but hardly any money? I asked the advice of seasoned TV performer Francis Wright, who said “take the money and run”. But I weighed the money against the freedom of the beach, and decided to be my own boss with my own show, trading in a joystick for the laugher of children and total control of a comedy puppet show in the open air. So although on “Labyrinth” I was being paid as much in a day as I was likely to earn in a week busking, I left the film set, and with my partner Su Eaton headed for the seaside. Foolish? What if…..? It turned out to be a wet summer, but we did shows when we could, and we both love the excitement of live performance in the open air. In September I was offered another few days on the film, and fit and tanned I bounced into the studio, to find the bulk of the puppeteers to be slumped , world-weary in their chairs. This, together with the often-heard declaration from the TV career puppeteers that “one day I’ll do a show of my own”, I knew I’d made a reasonable decision . Labyrinth continues to have something of a cult following, and I was amazed by the response a few years back when I offered my threadbare sweatshirt with the Labyrinth logo on Ebay. It sold for £125 to a collector in the USA. Blimey! I guess I ought to treat the movie poster with more respect. I have one signed by Jim Henson which say “Thank you Martin.” It’s been rolled up in a tube in my shed for 25 years………… Being a tiny part of the film was great experience with plenty of happy memories. Thank you Jim! Here’s some backstage photos I turned up the other day. Time for the world to share! It was just a whimsical idea really….. a small part of a show based on a whimsical notion. Whimsy has been somewhat out of fashion for a while………….. So this is how it goes: The wind blows a lollipop lady’s sign away. 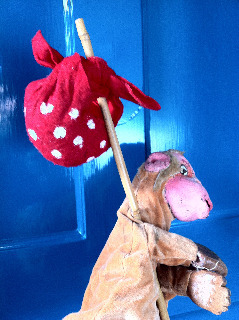 A magic hat enables her fantasy of being a pirate to come true and she looks for the lollipop on a tropical island. The wind changes direction and blows the ship to the Arctic where she meets a concertina-playing polar bear sitting alone on an iceberg. He is next to the lollipop which he has mistaken for the North Pole. She claims her missing equipment and sails away, using her sign to stop a shark eating the little fishes. The magical hat which enables the wearer to realise their dreams lands on the polar bear’s head. He wishes it would get colder, so the iceberg won’t melt, and sure enough, it snows. I wrote this scenario five years ago, mainly attracted by the sadness of the lonely bear in the vast wilderness, although I was aware of the issue of global warming which was just starting to enter the popular consciousness. Bringing the show back now, I fear it looks like I’m on a soapbox. Although I’ve been a Green-supporter for 30 years, I personally have little time for, wait a minute , no………I detest shows for small children which are overtly issue-based. Why? because it’s not the children’s’ fault the world is in such a mess. It’s really no good dumping our guilt of inaction, or of of our inept attempts at action, upon the bright optimistic young minds of the next generation. That’s not to say I don’t realise the responsibility of performing for children, it’s just that my priorities are different and I choose to focus on other aspects of influence beyond the narrative. There’s lots of other sequences in “Head in the Clouds” where dreams come true, but to describe them would only repeat my main point which is the tendency to look for the “message” in a story, and even a moral. I don’t know which straight-laced Victorian insisted all stories should contain an improving moral, but the legacy of that idea still resonates, and because of it people sometimes miss the underlying nourishing themes of stories, and look for a more superficial interpretation based on what happens, rather than why it happens. Added to this is the simpler but powerful effect a good theatre visit can have on a young audience, which is to see someone doing something unusual and wonderful (and live! ), and to realise that many other options are available beyond the alienating screens that provide the bulk of their stimulus. Pretentious? It is after all just glove puppet show. Well, the power of this form to the 4-8 age range is immense, and sensitively performed it can be unforgettable. Not a lot of people know that! But it’s true…when I was an art student, I had a summer job working in Madame Tussauds as a guard, and often my task was to stand next to the raised dias on which stood effigies of the royal family, and to strictly enforce the rule that no one was allowed to get close to them and especially not take photos. I seem to recall no photos were allowed anywhere in the building at that time. As a republican I can’t say I cared in principle whether the tourists rearranged the models into compromising positions and stole the jewelry, but you know, a job’s a job at that age. I preferred it when the daily rota put me in the Chamber of Horrors where plenty of fun could be had as tourists prodded me to see if I was real or a waxwork. People still do that now from time to time. Should I be concerned? Now the entire attraction has changed, with open access to all the exhibits throughout the building, with the entire emphasis on photo opportunity. Having just returned from performing at the Beverley Puppet Festival it occurs to me that I have no photos of the weekend. I experienced the event and the place without the urge to visually record everything for….for what and for who? The memories will be strong, without the need of photos to trigger them. The experience was at once intense (me and Su performing two shows then watching five) and sociably relaxed, meeting with folks involved in the puppet bubble who we rarely encounter during the rest of the year. In this age of recording trivia and ephemera and instantly placing it on the social networks to become tomorrows virtual fish and chip wrappers, it was refreshing to be reminded at the start of each show that no photos were allowed, and also that we should all turn off mobile phones…. Could theatre be one of the last places where we are stripped of devices and have our senses fully involved? Or, in order for it to survive will it have to do the equivalent of commercial tourist attractions like Madame Tussauds waxworks, and become a place which gives endless photo opportunities? There is a serious point here, because all forms of theatre struggle to get audiences. I’m hardly the first to point out the strangeness of the convention that has evolved of buying a ticket to sit in a large room full of strangers in order to sit for an extended period staring at a stage with people pretending to be other people, or indeed puppeteers helping objects pretend to have inner energy. There has to be a strong reason to decide to do that, when there is such a rich choice of new media alternatives that are often cheaper and more interesting. The rise of stand-up comedy is hardly surprising. It offers the venue good value, especially when the comic is well-known and brings in a full house. Laughter binds the audience into a social whole, and the event is usually theatrically edgy in the sense of it being very live and happening. And dangerous too as to whether the comic will deal with improvised banter and situations, or indeed be funny! Often the performer will deal with relevant political or social dilemmas, however big or small, in a way which the audience will recognise and relate to them. So at the Beverley festival I was particularly pleased to see “The Great Puppet Horn” performance in which two performers bombarded the audience with throwaway visuals and disparate storylines and sketches which came together in the end in a suitably mad but satisfying way which pricked the boils of concerns about contemporary life. I wonder if the “p” word will work against them though. What they did was not part of the man in the street’s definition of “puppet”, so they might be better off ditching the word and finding something more intriguing. Trying to think more positively though………many people have tried reclaiming the word for adult audiences with varying limited success so maybe this will be the breakthrough moment. Will have to stop now as I’ve just heard that the Queen is going to end her Jubilee tour with a visit to the New Forest Show, just up the road from us. Who will guard her from the ponies?I’m sure there’s a job opportunity waiting for me. Or certainly a photo opportunity. Su and me helped a little at the start of the project, but really the Oasis crew did the bulk of the hard work, and they won through, defeating adult groups along the way. This was not a youth theatre competition! By chance, Su and me have been publicising our new production based on the same story , though with an entirely different style and theme. It’s called “Jack at the Beanstalk Cafe” and will feature table-top puppets and shadows. Su and me performed our seaside Punch show at Norwich Puppet Theatre along with the ever-seasonal “Piggery Jokery” for their “Punch’s Picnic” event. This was followed the next day with a masterclass in P&J which developed into a fruitful exchange of knowledge. Just back from a weekend in London. So there was Su performing her delicate and enthralling story about a nervous umbrella lady, in the focused atmosphere of the Little Angel theatre in Islington, while I knocked wooden-headed dolls together in the noisy churchyard in Covent Garden, at the 350th birthday of Mr Punch. Two ends of the puppet spectrum in lots of ways for us. There’s the difference in form, where one is a busking act, designed to create a crowd from nothing, and end by passing the hat around, while the other is advertised, has people look at a brochure to decide whether to come, and then phone to reserve tickets and pay to buy them. One is comedic and ephemeral,and the other is emotionally affecting and dramatic. And in the case of Punch, it was for me a return to something I used to do years ago, and one I had made much effort to abandon. For Su, her solo show is one that stretches her talents, and combines her music, illustration and storytelling in a fairly unique way, the culmination of a creative journey. Although visual, her technique for this show at least, involves minimal, delicate puppetry. The main character lives, but it is brought to life perhaps as a child might play , and the audience certainly care about it’s progress through the story. My Punch show is all puppets, brought to life with vigour, and rough puppetry. Punch is a limited format, however you look at it.The variations are interesting, reflecting the abilities of the performer, but the expectations of the audience is generally low. The Little Angel theatre is billed as “the home of British puppetry” and so the expectation is high. Two ends of the spectrum. For most of the time these days we exist more in the middle of the spectrum. I perform my solo show in schools in a form which uses well-designed puppets and a far more subtle technique than the squawking, elemental Punch. And together with Su we perform in theatres with a more lyrical style, though with plenty of humour. And also we have two-person shows which we perform out of doors at festivals, placed on the popular end of the spectrum, with sensibilities drawn from the more artistic end. I’m not sure if I’m making any particular point here, but I suppose it’s a reflection which we need to make from time to time as we assess where we are and where we want to go with future work. We are in the fortunate position of having a wide palette from which to choose, and sometimes the blank canvas is a little unnerving!! 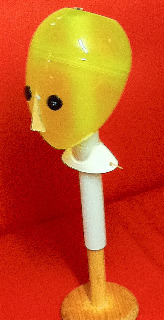 Su’s show is about confidence…maybe little Brolly will guide us in her umbrella boat to our next project. 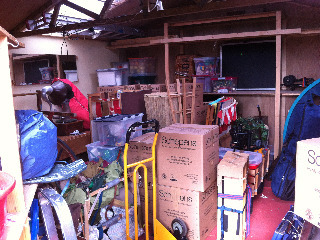 We’ve moved house that’s why…..and been doing lots of shows, and playing lots of music, and creating bits and pieces here and there. A house full of books, quirky ornaments, folders of drawings and paintings ,20 musical instruments, a workshop and loft full of 30 years of shows and puppets. No problem then. Lots of trips to tip, charity shops, lots of freecycle ads, and all with added pressure of deadline by our buyer (long story, very boring). Endless packing of boxes. 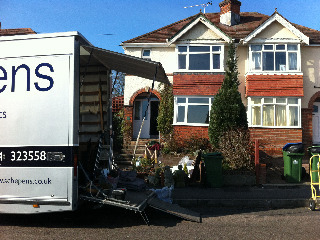 Brilliant removal blokes. Goodbye city…hello edge of forest. 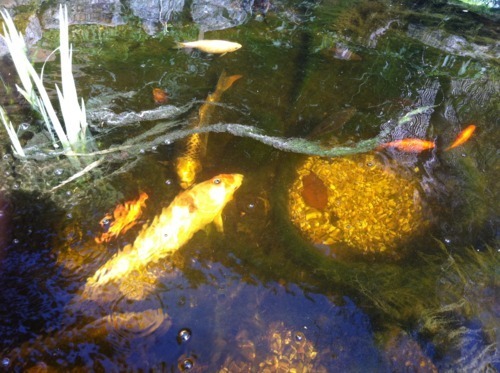 Fish pond. 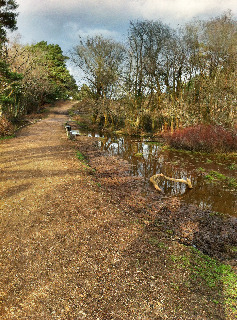 Country walks. How lucky are we? Very!! While all this was going on, we also did the usual schools touring,plus performances at Norwich Puppet Theatre and Polka Theatre, Wimbledon. 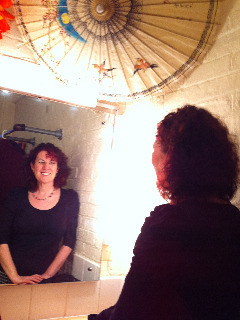 Here’s Su in Norwich with the poster for both our shows, and also in the dressing room at Polka. Lights around the mirror. Theatrical or what? Life should settle down a bit now, and we’ll be concentrating on enjoying our new home and seeing where the wind blows us next. Have just returned from a couple of days performing at the Ludlow Mediaeval Christmas Fayre based at the castle, and I am reminded of the tension between the academic/cerebral and the hedonistic/visceral approaches to life. These kind of events are populated by a wonderful mix of eccentric characters and also quite conservative types who happen to be attracted to eccentric activities. The event is huge, and hugely popular too. 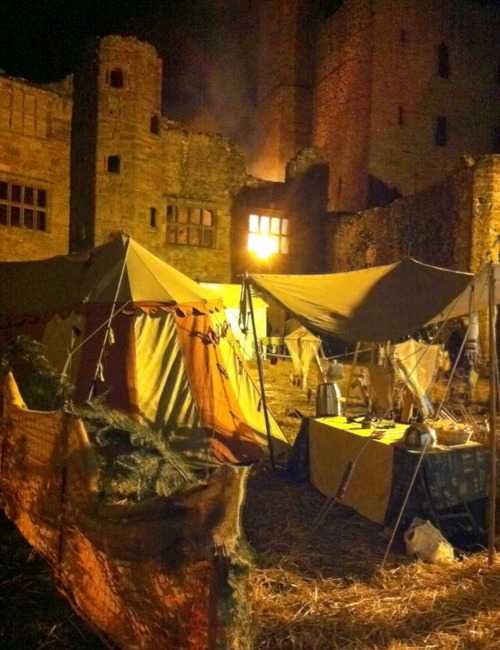 Any visitor to the castle on these days is swept along amongst a constantly moving crowd, past stall after stall of artefacts and food which give a strong impression of some imagined past times, helped by the costuming of all the stallholders and the absence of modern vehicles on site. Evocative music and strolling players add to the fun. 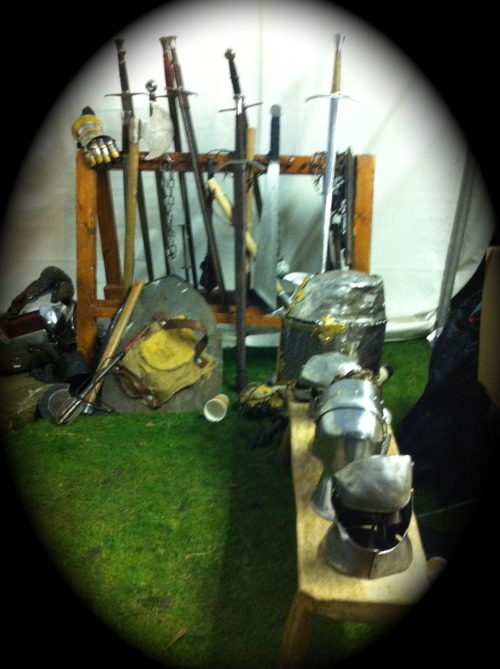 One might stumble upon knights in armour staging mock battles, or a Fool playing with fire or lying on broken glass. 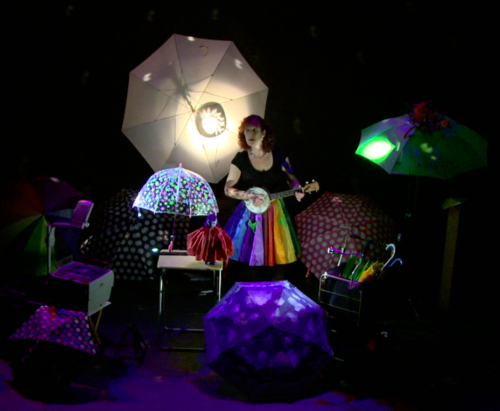 It is immersive and popular theatre without an Arts council grant. There are anomalies all around which become acceptable because visitors and performers are all part of the unwritten contract which says “we are all playing at believing in this”. The tale of Robin Hood is told ( brillliantly and hilariously by the way) via a radio mike. Electric spotlights light the stage when we come on to do our fake historical play. Some tunes which sound traditional turn out to be written recently but in an old style. Nothing wrong with any of this…….it’s all in the right spirit. Re-enactors are a breed apart. Certainly they stand apart from the stall-holders trying to make a living and the professional performers. Millions of years of evolution have been followed by the recent rise of modern society-a mere blink of the eye in the earth’s history-and perhaps it’s not surprising that so many people feel they’ve been born in the wrong century. Saddled with 9 to 5 existences, lots of folk opt to spend their weekends dressed in garb from some chosen era which appeals, in this case Medieval times. They add great background colour to the proceedings, but are unlike the performers in that they don’t adopt characters but are, by and large, walking coathangers for costumes. What a strange and wonderful world this is! Look down and you might see sturdy modern walking boots beneath the sackcloth leggings. Mobile phones in the back pockets. After all, we are all capable of holding two opposing ideas in our heads at the same time. English eccentricity is alive and in Ludlow! Waiting in the wings, waiting to go on, is a strange feeling, especially for a solo show. We’ve been performing in these places called theatres for thirty years, and although there is a familiarity about the setting up, and the protocols of the stage which once seemed so mysterious, it still remains a peculiar thing to do. Surrounded by mundane dusty backstage clutter, one attempts to put one’s mind in the zone of performance, to be on mental starting blocks to enter the space fully charged in the character of whoever we need to be. But there is the waiting for the cue to go, which will often go on for 5 or 6 minutes beyond the start time. During which time the mind flits between the heightened state of readiness to noticing the realities of the backstage surroundings, of hearing the voices of the audience, who are bringing there own individual problems and joys with them. In a moment the task will be to unite the disparate units into one audience, and to take them on an uninterrupted journey. And it’s going to be one of us out on that lonely stage for 45 or so minutes. I wouldn’t be the first to point out what a strange idea it is to have a group of strangers arrive in a darkened room to sit and watch someone at the lit end of the room pretend to be someone else! Despite all the experiments to disrupt this convention, it still persists. And while live theatre remains in permanent crisis because of the costs and the fact that it is a minority interest, it will always survive in some form or other because of a need we have to be transported from our personal dramas to someone else’s in order perhaps to shed light on our own. No amount of 3D cinema imaging or detailed holograms can substitute for the immediacy of a live show with fallible humans. And because we work in the medium of puppet theatre, we are also well placed for surviving an economic meltdown, as there are many ways of dodging and weaving a crisis by taking the stage outside the theatre building in the “traditional” way of the travelling show. In Russel Hoban’s magnificent book “Riddley Walker” the government propaganda is transmitted via the medium of official puppet theatre, in the absence of infrastructure for any other type of communication. Rogue shows emerge to challenge the status quo. So for the time being, Su will continue to enter that spotlit space and create her gentle magic with”Remember the Umbrella” and I will be with her for our two-handed efforts. 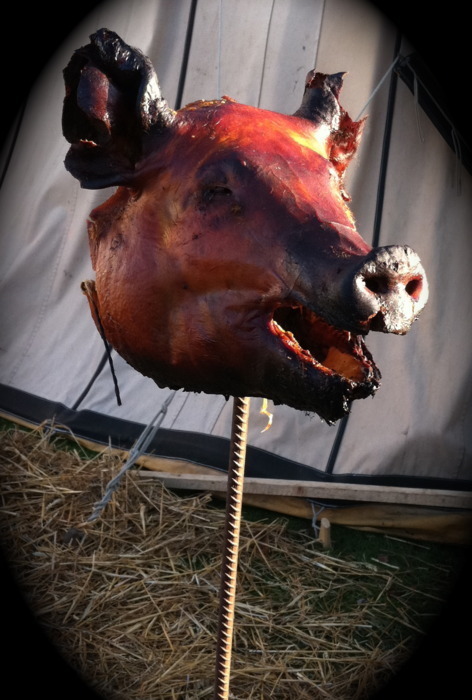 And we’ll keep our post-apocalyptic skills honed with our outdoor festival shows in the Summer!